Hi guys! I had mentioned on Facebook that I'd been working on getting some longer posts ready, and this is one of them! Today, we'll be focusing on some of Elevation Polish's one-of-a-kind samples and small batch prototypes. The samples are polishes that just didn't make the cut (too expensive to make, ingredients no longer available, didn't turn out as hoped for, etc). Small batch prototypes are the polishes that made it past the sample stage and into the batch testing stage, but still fell short of being released. First, I'd like to start with something that was never meant to exist. This is the error version of Rapa Nui. A small batch of Rapa Nui only made it halfway through the production process, which resulted in it never getting blue tint and added shimmer. A few bottles of this were unintentionally sold, and I ended up with one of them! The error version of Rapa Nui is a dark gray with very subtle red microshimmer. I think it looks like wet river rocks! It's quite pretty and personally, I feel it should be released! The formula was great and dry time was average. It was opaque in 2 coats. Here, you can see how the error version of Rapa Nui (index and middle) compares to the correct version (ring finger and pinky)! The correct version of Rapa Nui is blue and has more shimmer in it. Since there were two problems with an order I placed (one problem was the error Rapa Nui, the other was that I was sent Jungfrau instead of Marmolada), Elevation sent me a new Rapa Nui, the Marmolada I should have gotten, and a sample polish! This sample was called Golden Glacier. Golden Glacier is a bright blue filled with gold flakies. Due to the intensity of the base color, the flakies actually show up kind of green, giving it a kelp-floating-in-the-ocean sort of look. It dries semi-matte, but top coat makes it nice and glossy. Formula was great and dry time was average. I used 2 coats. 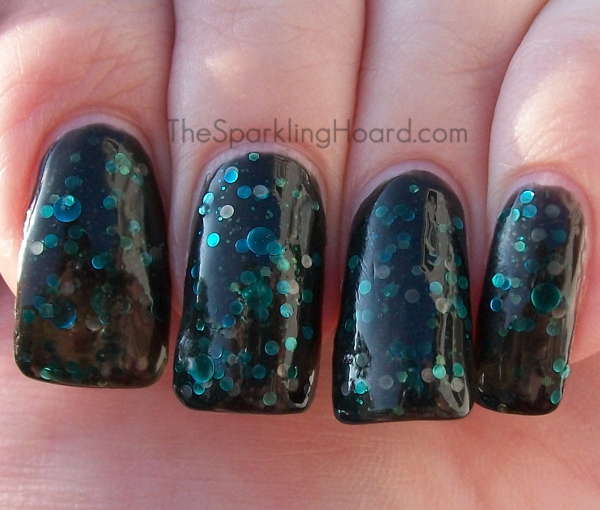 Next up is Sample JY#17, a deep, midnight blue filled with silver microglitter. It's very much along the lines of Essie's Starry Starry Night. It can look very dark/black in some lighting and was hard to photograph, but once you're in some good lighting, you see that rich blue and the silver sparkle. Formula was good and dry time was average. I believe I used 2 coats for this swatch. Small batch prototype Base Camp is a charcoal black jelly. This is actually a very nice polish and has way more depth and "squishiness" than seen in my photos. The formula was good and dry time was average. It's fully opaque in 2 coats. I decided to try out my first proper jelly sandwich! I did one layer of Base camp, then one layer of Elevation Polish Stay Behind Catch A Wave, then another coat of Base Camp. It probably would have turned out better if Base Camp had been more sheer, but it was still cool in a "dark and mysterious" sort of way. Unfortunately, there is no way to get any of these polishes anymore. However, you can shop for samples and small batch prototypes on the 7th of every month at 9pm CST at Elevation Polish's online store. A small amount of small batch prototypes are also available at 9am CST on the 22nd of every month. To stay up to date on the latest Elevation Polish news, follow their blog. What do you think? Do you own any of Elevation Polish's samples or small batch prototypes? I need to do more jelly sandwiches! I don't own many jellies, though. I'm probably going to get my friend to make me some, since I can get them super cheap that way!